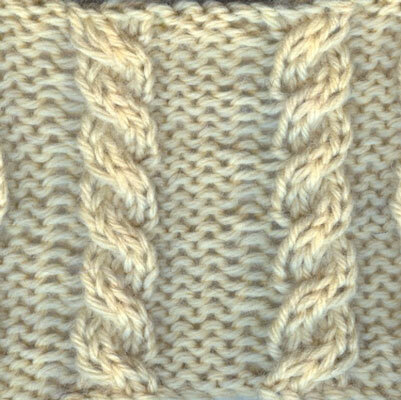 Four-stitch front and back cables are knit cables small enough to be used as an allover pattern without overwhelming the knitted piece. Four-stitch front (or C4F) looks like it’s twisting to the left, while four-stitch back cables (C4B) twist to the right. Slip the next 2 stitches on the left-hand needle to the cable needle and hold the cable needle to the front of the work. Knit 2 stitches from the left-hand needle. Knit 2 stitches from the cable needle. Slip the next 2 stitches on the left-hand needle to the cable needle and hold the cable needle to the back of the work. Rows 1 and 3 (WS): *K4, p4, repeat from * to last 4 sts, k4. Row 2 (RS): *P4, k4, repeat from * to last 4 sts, p4. Row 4 (turning row) (RS): P4, C4B, p4, C4F, p4. Repeat these 4 rows until you get the hang of turning cables.